NETWORK UPDATE: The VICTORIA’S SECRET FASHION SHOW gained another 0.1 in final ratings, putting it at 3.4. 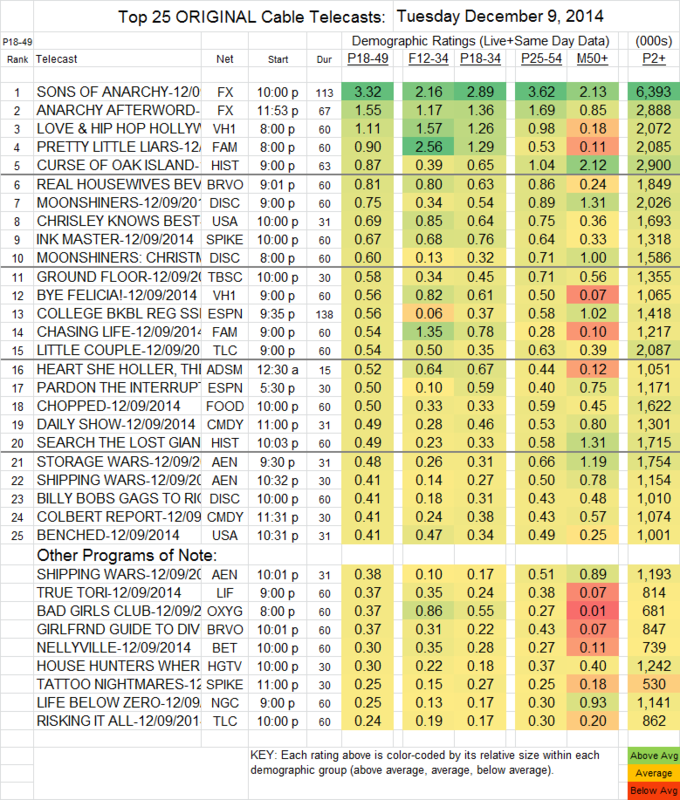 THE VOICE also rose 0.1, but both THE MINDY PROJECT and SUPERNATURAL lost 0.1. Of course the SONS OF ANARCHY series finale dominated Tuesday cable, up 0.7 from last week to a series high 3.32 (yet not quite the equal of those VICTORIA’S SECRET models). ANARCHY AFTERWORD climbed 0.45 to 1.55. What appears to be a special Tuesday episode of LOVE & HIP-HOP HOLLYWOOD (VH1) was at 1.11, scheduled as the lead-in to HEY, FELICIA which was at 0.56. The 2d episode of Bravo’s THE GIRLFRIENDS GUIDE TO DIVORCE lost a tenth to 0.37, and also lost more than half the 0.81 lead-in it had from REAL HOUSEWIVES OF BEVERLY HILLS. Special Christmas episodes at ABCFamily put PRETTY LITTLE LIARS at 0.90, and CHASING LIFE at 0.54. CURSE OF OAK ISLAND (History shed 0.11 to 0.67. MOONSHINERS (Discovery) dropped 0.06 to 0.75. On USA, CHRISLEY KNOWS BEST lost a tenth to 0.69, but BENCHED edged up 0.02 to 0.41 (outrating GIRLFRIENDS GUIDE on Bravo despite a lower lead-in). INK MASTER (Spike) was down 0.03 to 0.67. GROUND FLOOR (TBS) returned at 0.58. THE LITTLE COUPLE (TLC) fell 0.15 to 0.54. On Adult Swim, THE HEART SHE HOLLER rose 0.03 from last Tuesday’s episode to 0.52. NELLYVILLE (BET) lost 0.15 to 0.30.